Photo by Christine Wakfer, the Fernkloof Nature Reserve. This member of the Lanariaceae family was given this name by George Claridge Druce in 1914. It is found in the Cape Province of South Africa, growing in a well drained soil with some water and some to lots of sun sun. The woody and swollen roots can grow to three centimetres in diameter, the plant will grow from 30 to 80 centimetres in height. 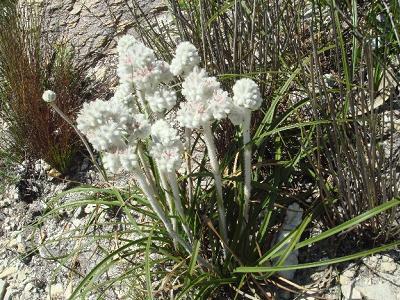 The flowers are mauve and almost hidden in a wool-like cluster. From Greek: lana meaning woolly (flower).